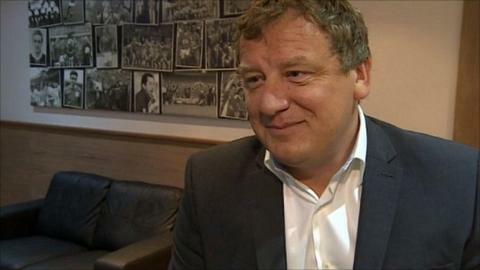 Swindon chairman Lee Power says he is hopeful of bringing in two new loan signings before the weekend. The club have been ravaged in recent weeks with a combination of injuries, international call-ups and homesickness hitting them hard. They also lost Bradley Barry to concussion on Tuesday so Power hopes to bring in reinforcements for Saturday. "We're trying to bring a couple of players in on loan," Power told BBC Wiltshire's Swindon Town phone-in. Power added: "These things take time but we are hoping to have two in for Saturday. "One I'm trying to get for Saturday is an experienced lad from a team the level above and if we can get him I'll be very pleased." The club host Peterborough on Saturday and sit only a point above the relegation zone. They will also be without forward Jordan Stewart who has returned to Northern Ireland with homesickness. Power is looking to move him on in the January transfer window but if they cannot recoup the fee they paid for the 20-year-old then he says the player will be unable to play elsewhere. "In all my days of football I've never known anything like it," he said. "I'm surprised and when you think about it that it doesn't happen quite a bit. He was only moving from Northern Ireland and not Iraq, we are surprised and disappointed. "It was a fantastic opportunity for the kid. I think his dad came over for a couple of days and said he would quit his job. "Unless someone pulls up the money that we paid for him he doesn't play football for three years which is a shame for the boy and financially not great for the football club."